Rescuers found the bodies during a 15-hour search effort. Authorities have opened a probe into the cause of the collapse and vowed to hold relevant parties accountable. Three other residents were slightly injured. It is thought that 20 people lived in the buidling. 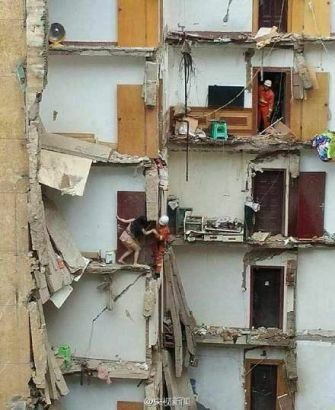 Resident He Chuqin told CCTV that she heard a sound like falling sand and her bed started to sway before the building suddenly collapsed. She and her brother were stranded in a corner of one of the apartment’s bedrooms until they could be rescued. A woman who lived on the sixth floor said she managed to stop herself falling by holding onto a door. She suffered a slight head injury. 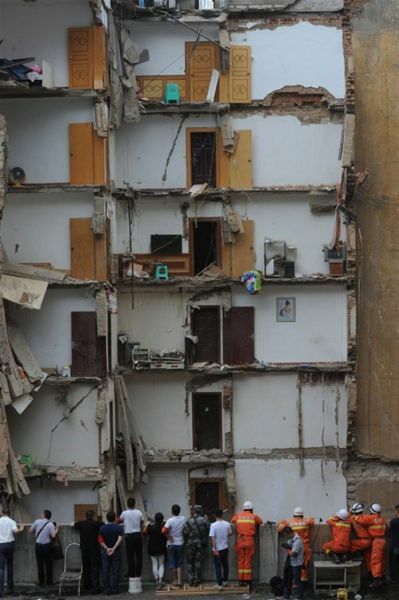 It was the second residential building to collapse in Zunyi in a week. On Tuesday, 68 people were evacuated and escaped injury before a seven-story building collapsed. A couple who had seen cracks appear on their wall had gone door to door advising all the residents to leave as quickly as possible. An initial investigation found that four floors had been illegally added to the structure. The materials used in the building were also not up to standard. There have now been five collapses of residential buildings nationwide since May 20, resulting in 26 deaths. On Friday, four people died when a five-story building in Huludao City in northeast China’s Liaoning Province collapsed. It is thought to have been the result of a gas cylinder explosion but an investigation is still under way. There was a similar incident on May 31 in the same city, when two people died in a building collapse also blamed on a gas blast.